Dark grey, non-adhesive finish to simulate the appearance of lead. Do not topcoat. The C150 Simulated Lead Flashing Trim is has a 150mm vertical face and 35mm wall penetration. It is suitable as a replacement for traditional lead flashings. It is supplied with a dark grey, non-adhesive finish. Topcoat does not need to be applied to this trim. 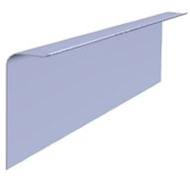 This range of Fibreglass Roof Trims replace the need for traditional lead flashing. Their dark grey appearance simulates the appearance of lead. They are supplied with a non-adhesive finish and do not need any topcoat applied.